If you are a teacher or a leader of teacher organizations, here is a seminar and workshop you might be interested in joining. Organized by the Teachers' Dignity Coalition, the workshop aims to improve the knowledge and skills of teachers and school administrators when it comes to their rights and responsibilities in human rights education. The seminar will be held at the Aringay Elementary School in La Union. Read the DepEd memo on the event below. 1. 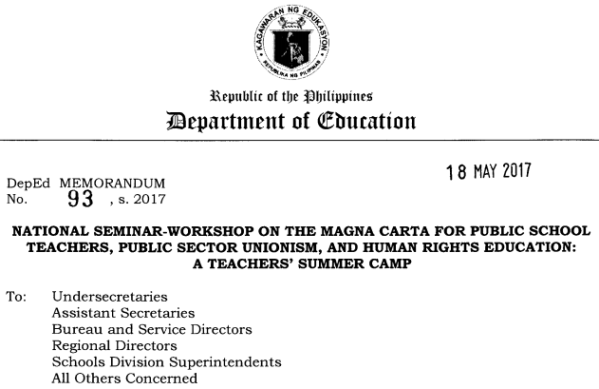 The Teachers' Dignity Coalition will hold the National Seminar-Workshop on the Magna Carta for Public School Teachers, Public Sector Unionism, and Human Rights Education: A Teachers' Summer Camp with the theme Rights and Responsibilities for Teacher and Child-Friendly Schools from May 25 to 27, 2017 at the Aringay Central Elementary School, DepEd Division of La Union, Aringay, La Union. 3. The target participants are teacher-leaders, heads of teachers' organizations, and school heads from public schools and sector unionism. 4. The participants from the Department of Education are authorized to attend on official business. A registration fee of One Thousand Five Hundred Pesos (P1,500.00) shall be charged to each participant to cover accommodation, meals, conference kit, and other incidental expenses. 5. For more information, all concerned may contact the Teachers' Dignity Coalition (TDC) Secretariat at telephone no. (02) 444-6564, Ms. Darlene Loro at mobile phone no. 0935-327-9359, or Mr. Benjo G. Basas, TDC National Chairperson, at mobile phone no. 0927-335-6375. 6. Immediate dissemination of this Memorandum is desired.